Generate traffic. Capture Leads. Convert them quickly. This is the main goal, right? Especially the “quickly” part. I know you are keen to shorten your B2B Sales Cycle…but despite your efforts, you can’t seem to stop it from getting dragged on forever. It’s not like you are so unlucky that you always end up getting the customers that take longer than necessary to make the final purchase. The real problem is how you go about your sales processes. But, fret not! Today, I am going to talk about some of the easiest and tested ways to shorten your B2B sales cycle so as to increase productivity and save resources. In the B2B business market, expectations can be huge. You want as big a fish you can catch. But that doesn’t always happen. Because first-time customers are not going to buy from just anyone. 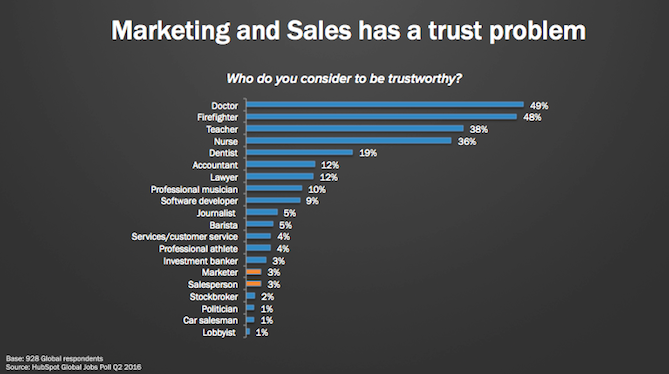 And the worst part is that marketing and sales have a trust problem, where only 3% of people said that they trust marketers and salespeople. And that’s the reasons why many professionals see an extended lag in their sales cycle. The best way to shorten your B2B sales cycle is by building a relationship with your prospects from the get-go. How will you go about building a relationship with your prospect? I’d say start off by asking your prospects about what their dream “agency” would like. This shows that you really care about your customers and want to live up to their expectations. Now, if you can demonstrate at least a few of the above-mentioned traits, then the buyer is likely to make the decision early on in the sales cycle. Apart from this, knowing about what you can do best and how to attract interested clients is the first step. This way you know what you can do and you can slowly scale up to bigger fish here. This eliminates the process of constantly chasing clients and working on what you get. Lead nurturing plays an important role in your lead scoring for B2B businesses. Because no matter where your leads are coming from, most of them are not even ready to make the final purchase. 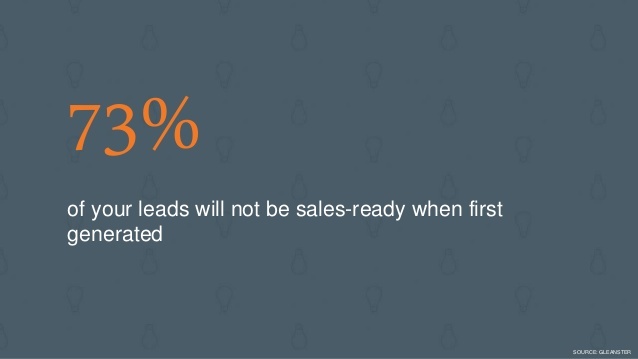 In fact, as high as 73% of your leads will not be sales-ready when first generated. So the onus to nurture them and make them sales-ready lies on you. And unless you go about nurturing them, your sales cycle will be extended for an abnormally long time. Unfortunately, not many sales professionals seem to focus on lead nurturing. There’s a silver lining, however. Sales professionals that take time to nurture their leads, see 50% more sales at a 33% lower cost. This means that they have succeeded in shortening their sales cycle to a large extent. Thus it is clear that lead nurturing and focusing on qualifying your leads earlier in the sales cycle will yield better results. If possible, you can even implement it as the first step to shorten your B2B sales cycle. Apart from this, using the data of specific visitors to your website or other lead sources can also help you in better lead scoring. This kind of information helps in assessing what kind of client will suit you better and be a better customer. Such factors not only help in assessing what kind of customers you have but also help you focus on the best. Our entire aim is to focus on the best and reduce the B2B sales cycle. 3. Who is a part of the decision-making process? The decision-making process of many companies is somewhat complex because it’s not a single person who takes the decision but a diverse team. Therefore, it’s important that you know who all are you going to deal with beforehand. Reviewing it will help you reach the right person, at the right time. You can also avoid wasting time and efforts in dealing with the wrong person. Determining who is involved in the decision-making process and researching their preferences will not only help in improving the sales returns but also shorten the cycle. That said, according to 90% sales professionals, there is always or usually one member of the committee who tries to influence the decision their way. This makes your task even more optimized. Now you just need to track down one decision-maker, analyze their behavior and specifications, and you can easily shorten your B2B sales cycle. Getting the attention of the proper members of the company will get you more results rather than talking to some third party or someone at a lower position. If possible try to sell to the marketing heads or the people responsible for decision making in the company. Knowing what you’re going to do in a sales meeting is important for both the client’s time and yours. Also, forecasting what actions you can take and how your client(s) might respond will help in turning the tide in your direction. Giving them actionable steps will further help in shortening the number of pitches you have to give to finally land a client. Moreover, the sales process will speed up when there is an omelet clarity regarding any issues on both sides. Telling the further steps as per client decision will help them know what is in store and let you know early if they’d be going forward. B2B clients turn to other business simply because they’re looking for solutions. Thus you have to clearly demonstrate how you can help them address their pain points. However, how would you address their pain points without identifying them? That’s why uncovering your client’s business issues should constitute a large part of your initial cold-call pitch. 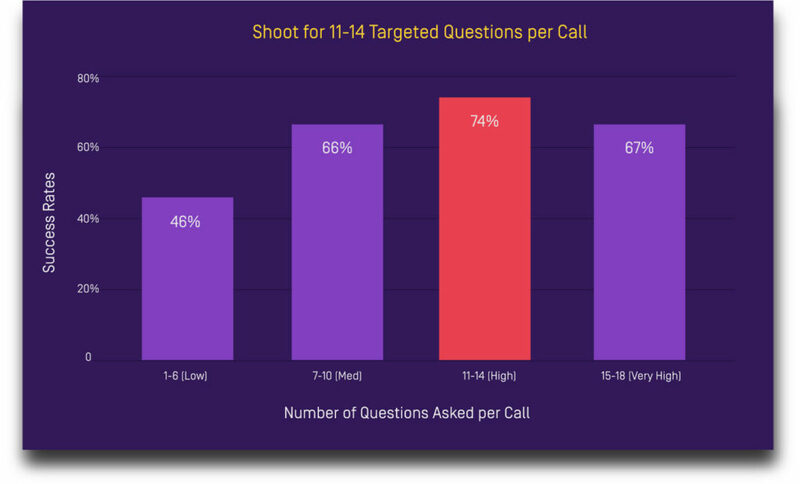 In fact, according to research by Gong.io, asking between 11-14 discovery call questions during the course of the call correlates with the greatest success. The solutions often matter more than budgeting issues. This is because they know what they want and what effect it will give on their company’s interests. Identifying what their pain points are will help you gain the edge over any potential completion and impress your client as well. If you’re able to plan and work on your product/service and sales cycle for their needs, you solve the equation. This is not only helpful to the client but also helps your company by reducing the time wasted in revisions and constant requests until the deal is closed. Negotiating and getting a good deal by addressing the pain points on both ends will easily help you shorten your B2B sales cycle. You can save a lot of time if you try to uncover things like what resources or solutions your prospects have tried in the past. And why did these resources not work? Because if you end up trying out the same things that your prospect has already tried, then you are setting up yourself for failure. Or an extended sales cycle. However, our goal is to shorten your B2B sales cycle, not to make it longer. That’s why I suggest you go through this issue carefully. You don’t even have to go all undercover agent in order to unearth this information. Directly ask your leads about it. This might work in your favor as your lead will reminisce what they have already tried, and realize how you can help them differently. This should also help them get a grasp of what they are exactly looking for. And this realization and enlightenment will definitely help you shorten your B2B sales cycle. It’s also great if you’re able to avoid the things that your lead has already tried and failed at, firsthand. Therefore, it is often better to analyze your prospects’ past cycle and take steps accordingly. Ideally, if the company has been marketing for a long time, this should be addressed as a first step. Sometimes your clients can back out if they object to anything. It is better to address and clear this as soon as possible. These are some of the tested ways using which you can shorten your B2B sales cycle. That said, shortening the sales cycle shouldn’t be done through any kind of untested shortcut. In fact, it doesn’t have any shortcuts. You just can’t make a jump to move over to the next step. Also, if you would go through these points carefully, you will realize that all these steps have one unifying character. That is, each of the points is somewhat dependent on building a relationship with your leads and interacting with them. Your sales cycle can’t magically become shorter or more efficient without knowing about it in detail. Monitor what steps you could take to improve it. Take actionable steps and figure out your client requirements. In short, the better you take care of your client requirements, the better will be the outcome in terms of returns as investments. Some clients can take a while in the decision-making process but the rest is up to you. What tricks do you use to shorten your B2B sales cycle? Do you think that lead nurturing is your best bet to shorten your sales cycle?